London doesn’t have a monopoly on poor air quality, but it does have a mayor prepared to make radical changes to improve it. Here in the capital we’re a week into the implementation of an Ultra-Low Emissions Zone (ULEZ), which has been rolled out in central London and will gradually expand across the whole of inner London between the north and south circular roads in 2021. London mayor Sadiq Khan makes no apologies for the ambition of ULEZ, determined as he is to eradicate poor health associated with air pollution. Some see ULEZ as a ‘war on cars’ but the fact remains that petrol and diesel vehicles will have to comply with emissions limits, and this includes Transport for London’s bus fleet which is expected to meet or exceed ULEZ standards by October 2020. By way of a recap, petrol vehicles that do not meet Euro 4 standards and diesel vehicles that do not meet Euro 6 will have to pay a daily charge. There will be two ULEZ charge levels: £12.50 a day for cars, vans and motorbikes and £100 a day for lorries, buses and coaches. 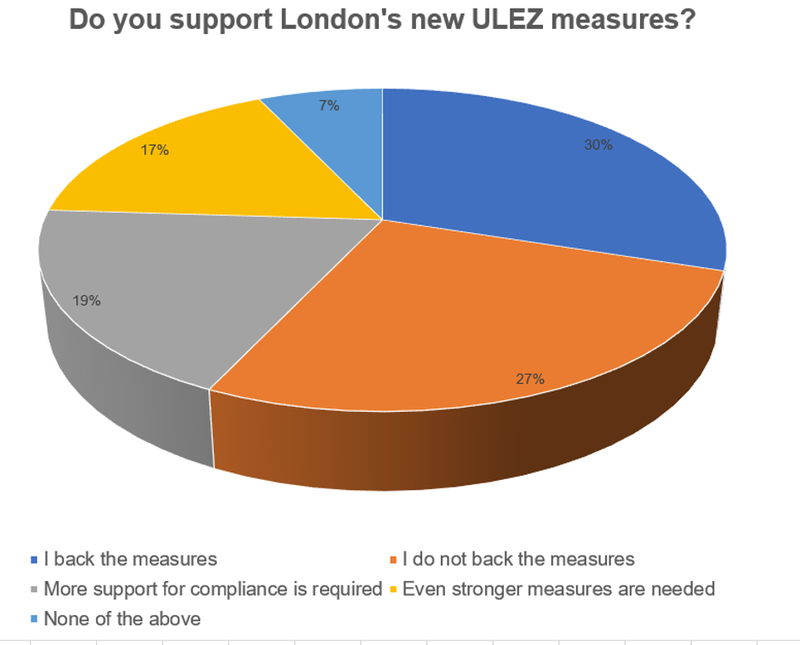 But how many of the 540 respondents to last week’s poll support the new ULEZ measures? A total of 30 per cent back the measures, followed closely by 27 per cent who do not. Just under a fifth (19 per cent) believe more support for compliance is required, and 17 per cent who believe that stronger measures are needed. The remaining seven per cent chose ‘none of the above’. What do you think? Keep the debate alive in Comments below. Before making a comment, take a moment to familiarise yourself with our code of conduct. My old car had a three litre diesel V6 that was Euro 4 compliant and therefore liable to the charge. I managed to replace it with the same model but with a six litre W12 that is also Euro 4 but, being petrol, escapes the charge. So the poor motorist is hit again, yet they (those driving older vehicles) are possibly not the main contributor to the air pollution of London. Aircraft coming in and out of the airports, trains (they aren’t all electric) and the boats on the river all contribute, but because they don’t cause congestion they can pollute as much as they like. Also, as pointed out many times not all the pollutants come from the exhaust … brake dust, tyre rubber and road particles. So, does charging work, simple answer NO it just brings in revenue, the roads remain congested and I dare say the air just as bad. Doing nothing is just burying our heads in the sand. A forthright approach is required from the outset and Sadiq Khan has done this. It will make individuals re-assess their vehicle choice and increase the number of EVs in the capital. This will also generate a new business culture around low carbon alternatives. This is the future. Absolutely right – no mention of pollution from building works or the way new buildings trap air pollution into canyons. Plus of course an even higher population density which has its own pollution issues. Nor mention that black cabs are exempt. If they were really worried and honest then they would ban the vehicles not up to spec. Instead it looks (is) more like a revenue generating service. No allowance for people that need their vehicles for transport of tools, equipment ,etc or for disabled people? So, the motorcyclist is being hit again. I have a Nissan X-Trail with a 1.6 ltr diesel that meets Euro 6 standard. I also have a Triumph Tiger 800 cc motor cycle. The road fund licence for the X-Trail is £125. per year. The Tiger 800 is £88 per year and creates much less pollution but is not taxed according to its emissions but its engine size. Motor cycles cause less harmful emissions and less congestion but as they are a small and relatively insignificant group they are unfairly targeted by the powers that be. I sometimes despair with the government of this country, guided by the civil service all of whom seem to have absolutely no idea about running a country. For God’s sake let the Engineers do the job properly. Rant over, for now. How really can that be enforced when MP have these heave limousines to carry them one at a time, and not only that, AFAICT, they further only emit hot gases in Parliament, and cannot even agree on Brexit, when the people already showed their very clear mandate on this topic years ago. It makes you all look quite lame, old chaps. Instead of worrying about ULEZ, why not simply take a deep breath, calm down, and get down to business of making things work? They should work all over the country, for everyone, and stop making special classes out of the citizens, pretending to be “royal” when you are not, etc. Comments like “our toxic air” are part of the underlying problem, our air is the best quality that it has been for decades. Yes, continual improvements are needed and some must be painful; however, massive economic problems for what is at best a marginal (and probably un-measurable), long term benefit is the economics of the mad-house. Cost / benefits assessments seem to be a thing of the past (apart from NICE). Seems to be a sticking plaster ‘solution’ based more on politics than real action. It does nothing to remove polluters from the roads. London doesn’t exist in a vacumn, so what about the pollution drifting in from the M25 and Heathrow ? Is the revenue raised being used, exclusively, to tackle pollution and it’s affects ? another money farm from the blood sucking politicians in the name of the “greater good”. So a 6 litre car that is Euro 4 compliant will pay nothing, but a 1.1 litre car that is almost compliant will pay £100, despite that fact that it will cause less pollution. Also an old car, that is belching clouds of smoke, that was compliant on the day it was purchased will pay nothing. So it doesn’t really have anything to do with actually reducing pollution. It is just a combination of “tick in the box” proposals and tax increases. The biggest diesel polluters in the city centre are the black cabs. They should have been compulsory euro 6 standard many years ago, and they should be the easiest to regulate. If they are exempt then who is in charge of city hall? Make the congestion charge dependent on the pollution measured during the annual MOT so a well maintained older car will be cheaper to run. Introduce a re-test provision if the owner wants or the police demand. Use independently validated data for new cars. I think the issue is something to be concerned about, but the avg speed through London is <11mph. Most Car s are parked in London in 45mins or exiting in 45mins but Buses and lorries take longer. Most Buses are older than 5years and can be in London for 2 hours now X that by 300 and all the cars in London would not put out as much toxic gas. If they want to make a big improvement insist on electric buses and goods transported by rail with small electric vans to do the runs between station and End User. I see Fiat have teamed up with Tesla to side-step the emissions regulations of their fleet average. If the politicians allow this then the lunatics are certainly in charge of the assylum. They are ignoring the elephant in the room ! The greatest polluter of London’s air space is Heathrow and they are expanding that. “Something had to be done…” “London’s air is thought to lead to thousands of premature deaths annually and increases the risk of asthma, cancer and dementia” Sounds like the something that had to be done was to stop guessing or inventing cause / effect paths, and do some actual science to establish some facts. Logic seems to go out the window whenever one of our green friends pops up with their latest theory presented as fact. It’s not too far removed from the “MMR causes autism” claim that is leading to a new Measles epidemic. Politicians see a new excuse to tax the motorist, knowing full well it will make little or no difference either to air quality or to traffic levels. As usual the infrastructure for rapidly increased EV use is not in place. The single policy lobbies are out (Heathrow, black cabs etc) in force. The only way to reduce London’s congestion problems is to stop expanding business in London. (Oh and maybe population control – but that would earn a gold star for any politician brave enough to suggest it). Thank the Lord I don’t need to visit London that often, but I can’t escape the lunacy & greed of politicians. This is from a very interesting set of publications from Imperial College, (all are available on HMGov website). The conclusions are based on a complex computer model that invokes a lot of fuzzy correlations for topics that are not amenable to the physical laws of nature. It is a thorough piece of work and well worth reading, but is not suitable to be the basis for policy making as it cannot be validated. There seems to be a widespread belief that the more complex a computer model is the more correct it is: while experience shows the opposite to be the case. There is little apparent sensitivity testing in the publications, yet this is essential in exposing the weakest parts of the model: so it is a belief based model. If the health cost/benefit implications were validated by NICE I would feel a lot more confident in it. Buses and taxis are major polluters in London and other cities. The exhaust and heat concentrations where many of these congregate are unpleasant and unhealthy. Ironically the whiff of diesel exhaust is evident at St Pancras from diesel trains operating to/from the East Midlands and Yorkshire. The pausing and cancellation of electrification schemes by the current Secretary of State has a grim irony to it. Government aspires to delete diesel traction on rail by 2040 (?) but has no strategy for wiring up more of the network or addressing the needs of freight . Left and right hand etc. In France there is a sticker scheme where you pay a one off charge of 3.70€ for it & this means that on certain days when the pollution level is too high for the pollution Specification level of your car, you are not allowed to drive into the city between the hours of 8am to 8pm. There are no extra charges apart from a fine if you do drive in & are not supposed to. This means that no matter how wealthy you are, you are not supposed to drive into the city. New cars can be more polluting than a 5 year old diesel if it is a Ferrari or Porsche, Rolls Royce etc! Their Co2 levels are double a diesel. This is the only fair way of actually stopping the pollution levels from getting any higher, by stopping all cars & lorries from entering the city centre regardless of what vehicle they drive.. The governments methods do not stop pollution; it has not worked in London; nor will it work any where else. All they do is get more money out the average person who cannot afford it, while the wealthier people can drive in with their much more polluting cars and don’t care about the pollution. Considering the weight of evidence from multiple countries it would be willfully ignorant to not urgently tackle NOx & particulate pollution. As to just how effective the solution will be? That’s harder to pin down. You cant blame government for choosing to charge motorists. Simply banning the worst cars would have constituents gathering pitchforks & torches. I do appreciate the fact that coaches & lorries will be charged a higher amount as companies using them will be much more able to stump up the cash & replace their vehicles than individuals. The government are not getting their facts right. They need to stop all vehicles from going into the city if the pollution level is too high; this includes all of the rich in their highly polluting cars. Stop charging and just getting loads of money off people who cannot afford to change their cars and actually stop any car that does not meet the criteria; this includes Ferraris and lamborghini’s, Porsches, Rolls Royces etc. They cause more pollution than my 8 year old diesel which is Euro 5 spec.